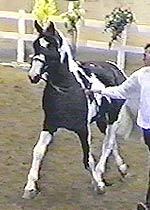 Below video clip links where taken at Sempatico's German Stallion Inspection/Licensing. Depending on file size & your connection each clip takes a minute or two to load. Sempatico qualifies for the BLM at his first dressage show with his rider Erin Freeman! 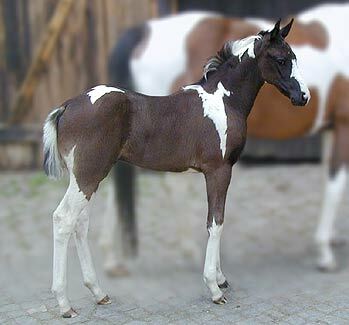 DNA Tested Homozygous--One of only 2 German fully approved Homozygous pinto for full Warmblood breeding stallions in the world! An outstanding Approved young stallion, has arrived in the USA from Germany where he finished his testing for lifetime approval. 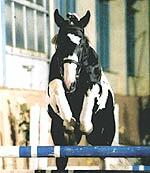 DNA tested HOMOZYGOUS-100% color guaranteed, which makes him one of only 2 book I for/by Warmblood breeding and pedigreed homozygous Warmblood stallions in the world! 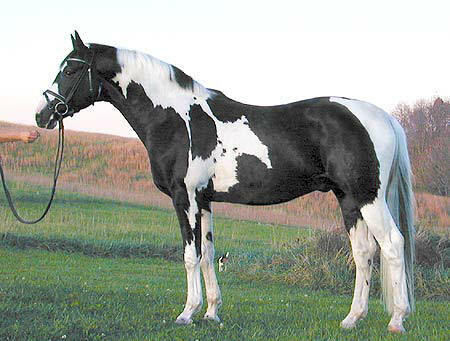 less then 3 months undersaddle. Sempatico has completed both his 30 day test & 70 day test at Prussendorf finishing 5th out of 18, 3rd in dressage index and 8th in jumping index. Final score: 7.81 Also at the announcements of his scores Frank Bangert the head director of Prussendorf State Stud said "Sempatico is the best colored horse he has ever seen" and congratulated both Gestüt Falkenhorst and his breeder Mr. Michel on such a nice horse. In his 70 day testing, Sempatico finished 6th in dressage with a great score of 121.25 points! 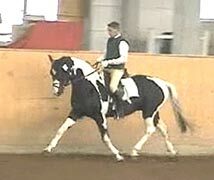 He placed 11th of all 30 stallions in this testing with a total score of 106.67. 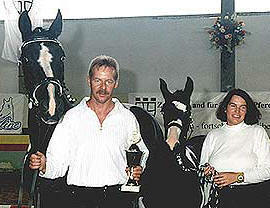 Breeder of Sempatico; Hans-Jürgen Michel at Pinto Bundeschampionat pictured with Sempatico as foal, his dam the handler and their championship trophy. 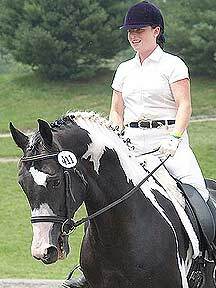 Anita Heuser, the Thuringian Vice Master of Dressage, had Semptico in training, she states that he is not only wonderful to watch but equally wonderful to ride. 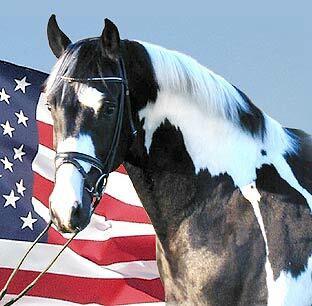 Sempatico started out in the USA at Willowlake Farm being ridden and trained by Carol Lawrence over the winter. 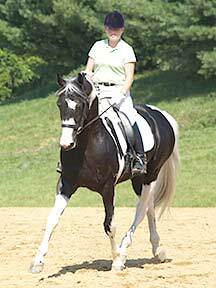 Everyone at Willowlake had rave reviews for Sempatico, they loved his temperament and Carol loved how wonderful he was under saddle. 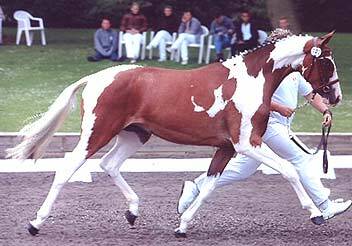 Sempatico's first show in the US was Dressage at Devon, with little preparation (due to a tornado we had here and Sempaticos heavy breeding schedule earlier in the season) Sempatico shined; placing in the top 4 in every class and winning all of his IBC classes. 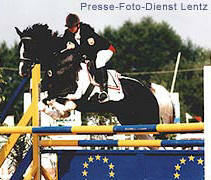 We hope to have Sempatico debuting at FEI levels in 2008. 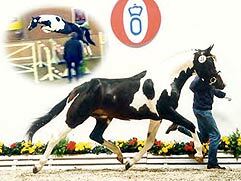 With limited showing due to an extremely busy breeding schedule he Sempatico qualified for the 2006 USDF championships at his first show. He also is winning at 1st level. 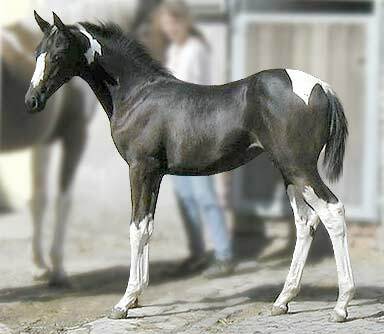 Sempatico's first foal crop in Germany had 2 inspection Champions out of a very small foal crop. 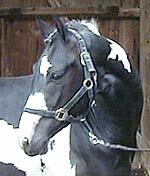 The two fillies pictured below are owned and bred by Gestüt Falkenhorst, the first was inspection Champion and first premium, the other was also premium both are homozygous. The first US foal crops have received numerous premium ratings and several championships at their various warmblood inspections. 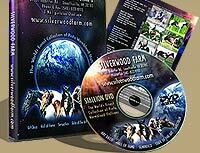 Designed by Lizard Graphics © 2001-2015 All images/materials on these pages are copyright protected and can not be used without written permission from Silverwood Farm, Lizard Graphics and or the various Photographers.